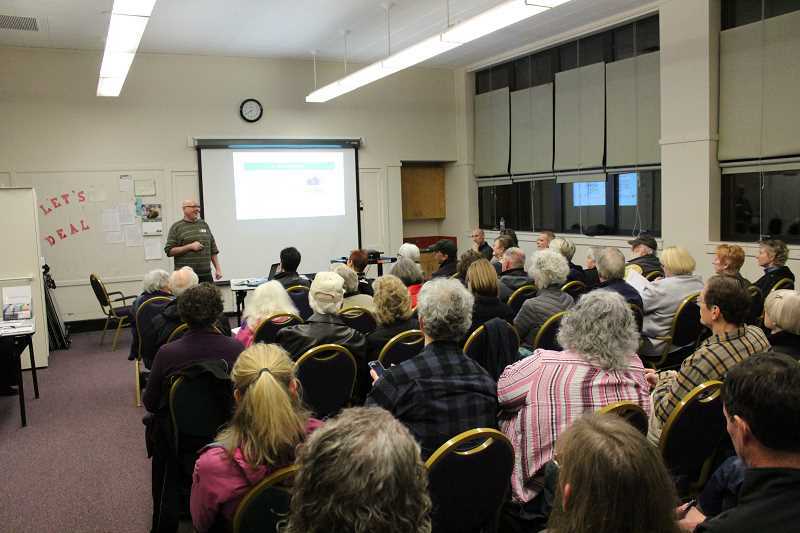 The City of Portland's law requiring homeowners to attain an energy score before listing their home for sale went into effect this year and officials from Earth Advantage came to Multnomah Arts Center in late January to discuss the new requirement with Southwest Portland residents. Before listing their home for sale, Portland homeowners must pay an assessor to analyze the facilities and structure of their home and determine an energy score based on a 10-point scale. The energy score lasts for seven years and can be updated every two years; the homeowner is responsible for attaining the score and the real estate broker is responsible for listing it. The scores are then added to the Portland Green Building Registry and home buyers can access the database to examine all reported scores. Scores typically cost between $150 and $200. Though it's not the first city to initiate an energy score program, Portland is the first city in the United States to mandate the score. "It's the future," Earth Advantage spokesman Ron McDowell said. "We're ahead of the curve." The City of Portland trained about 150 assessors for the program. The energy score database is meager now but, since 14,000 houses go up for sale each year, it will become more robust quickly. Founder of HomeEnergyScore.com Brian Denne says the size of the home, the number of bedrooms, the furnace and the installation are the most important factors in determining energy scores. However, the energy behavior of the homeowner as well as movable items such as washers and dryers are not factored into the equation. And other more minor changes such as adding windows don't contribute much to the score. Denne says the energy assessments are similar to typical home inspections, but energy assesments also provide an estimated cost of energy use and an energy score. Of the hundred or so people Denne assessed in January, he says only one of them made improvements to their house based on the information. The man who made changes spent $1,000 on installation and improved his energy score from a three to a five, Denne says. Denne and McDonnell stressed that the requirement isn't as burdensome as it may seem and is designed for the benefit of the buyer. "We're doing it for the millennials. We're doing it for the buyers. I look around the room and I see a lot of grey. We're Southwest homeowners. We're baby boomers for the most part. I'm right there," McDowell said. And McDowell says the millenial generation cares more about cost than top-notch appliances. "I'm a real estate broker so I've seen it all, but for a lot of people in our generation, its nice cabinets, wood floors, granite," he said. "I have a 31-year-old son. He doesn't care about that stuff. He wants to know how much money it's going to cost for him to own this home for the next 10 years." And Denne says, for most people, the energy score won't be a determining factor in their purchasing decision. "People don't buy for 10s. And your neighborhood is probably all close to the same score. Ones to fives, that's most people in this room. That's just the way it is," he said.